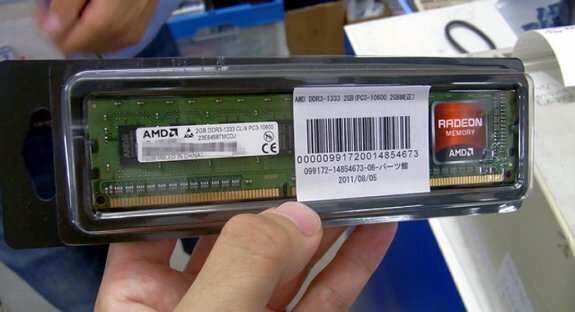 Every once in a while news really hits you by surprise, such as today's report from PC Watch that AMD Radeon branded DDR3 memory modules have hit Japanese retail stores. According to PCWatch, the modules are already on sale in Japan, and as you can see they're carrying AMD-branded memory chips. For now, the modules are solely available in 2GB capacity and divided into three segments: Entertainment series operates under DDR3-1333 designation and offers latency of 9-9-9, "ULTRAPRO Gaming" series operates as DDR3-1600 at 11-11-11 latencies, while Radeon for Enterprise is pending launch, with a lot of details being market as "TBD" (To Be Disclosed). A product page over at AMD's website confirms these modules are really marketed by AMD, and reveals the company plans to target the "Entertainment", "ULTRAPRO Gaming" and "Enterprise" markets with its 2GB DDR3 modules. Why the company suddenly jumps into the memory market is a mystery to me, the modules have poor specifications and it's not like you can make a quick buck in the memory market these days. "ULTAPRO GAMING" with 11-11-11 latencies at 1600?!? My Mushkins do over 1600 at 6-8-6, and over 2100 at 8-10-8. Hopefully these are priced about $30 for a 2x2GB kit, because they are only worth about that.